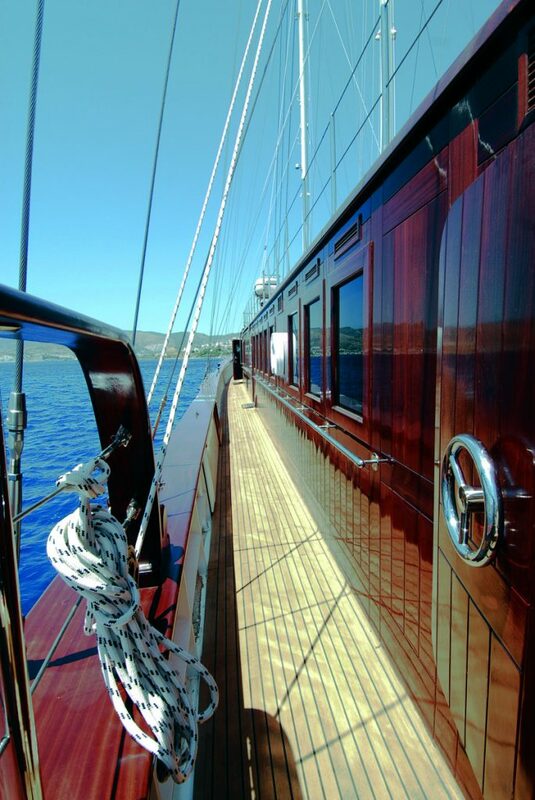 Protecting wood and wooden surfaces, for example, deck rails, in the marine environment is of vital importance. The environment can present all sorts of effects that can not only significantly reduce the aesthetic aspect of the wood but also cause deterioration of it too. Primarily due to the salt from the water and the exposure to the sun’s UV rays. Also, the weather can play a significant role in wooden surfaces deteriorating. Be it the strong winds or the heat and humidity caused by the sun. A combination of Deks Olje D1 saturating wood oil and Deks Olje D2 can help not only retain an aesthetically pleasing look to decorative wooden finishes, but it will also contribute to protecting against any effects suffered as a consequence of the marine environment. Deks Olje D1 saturating wood oil works by soaking deep into the wood, strengthening it against the potential deteriorating effects of the environment, leaving a transparent matte finish. Deks Olje D2 attains a high gloss finish after application that is hard and durable. It doesn’t chip or peel off easily. It is incredibly simple to use and is ideal for marine uses above the waterline which will not be walked on. This is primarily because it would be very slippery! Before applying either, it’s important to clean the surface thoroughly. It is recommended that you use Owatrol Wood Deck Cleaner to produce the best results. This will help to remove any ground in surface dirt quickly while allowing Deks Olje to penetrate the wood more efficiently. 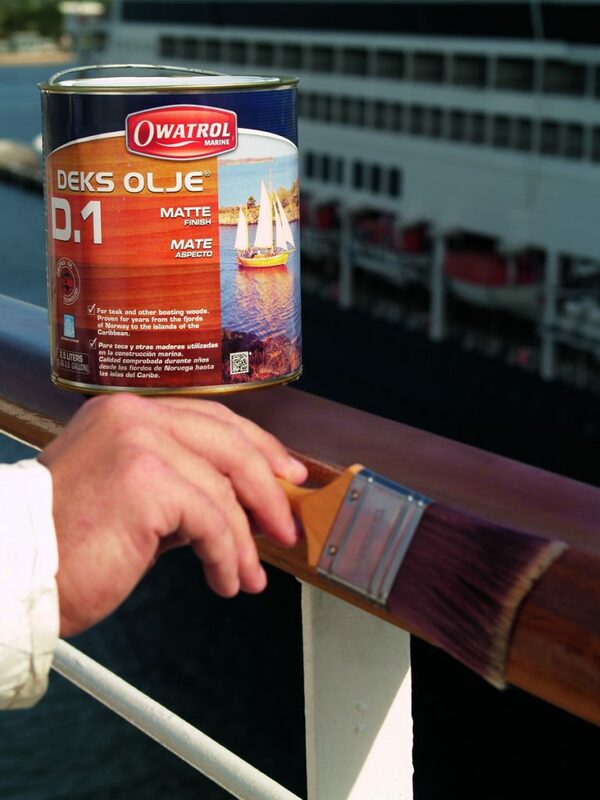 If the wood has been stripped using a product such as Marine Strip, then Deck Cleaner will help to neutralize the wood surface before using Deks Olje D1. To apply Deks Olje D1, saturate the wood thoroughly using a standard brush or roller by applying coats of the oil ‘wet-on-wet’ until the wood cannot absorb any further oil before allowing it to dry. Then follow up by applying Deks Olje D2 to achieve a nice glossy finish. For a satin gloss finish, it is recommended that after using D1, you coat the surface with a mixture of D1 and D2 at a 50:50 mix ratio. For a high gloss finish, after applying Deks Olje D1, finish off by applying six coats of Deks Olje D2. Deks Olje D1 is designed for penetrating dense hardwoods but can be used on softer woods too. It is equally adept with projects above and below the waterline. It’s important that during application, D1 is kept active by applying the next coat before the previous has dried until the wood is fully saturated and will not absorb any further oil. Due to Deks Olje D2’s glossy nature, it is unsuitable for walked on areas but is ideal for handrails and decorative features. D2 is a highly flexible oil varnish which provides a thin layer when applied to a surface. Applying six coats will achieve the best results as it will ensure the product has the correct build of layers, resulting in a better finish and performance. It is suitable for uses above the waterline. 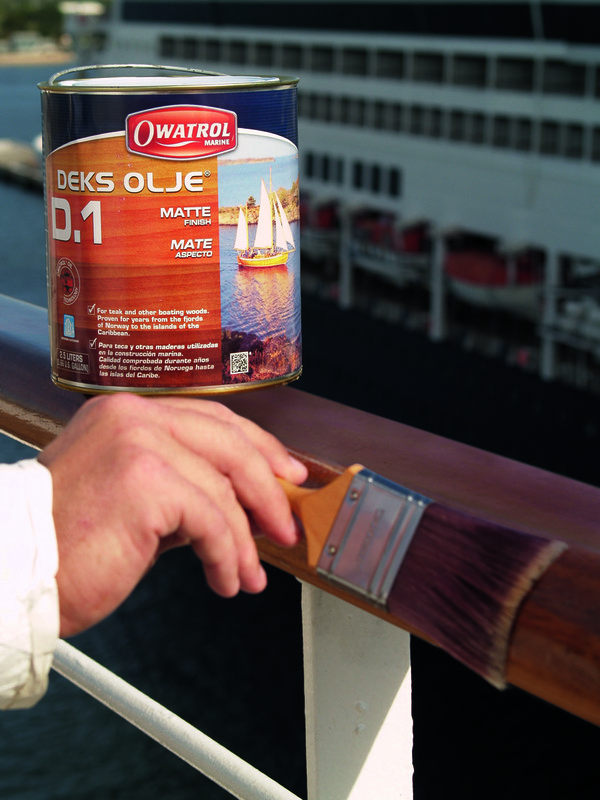 The combination of Deks Olje D1 and D2 can significantly enhance the way deck rails look. 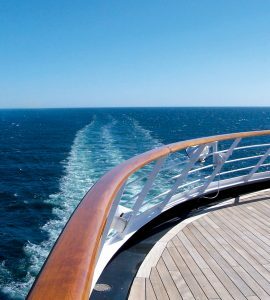 The manipulation of the products in certain ways can help produce the exact finish that you are looking for, while also providing that shield against the harsh environmental effects often seen at sea. Check out our video below for more information about Deks Olje D1 in action.